We're very busy bees here at Bradfield Brewery doing all sorts of exciting projects. We'd love for you to know what we're up to, so please have a look through our latest news. Fox Valley Sheffield was host to the grand finale of Tour De Yorkshire 2017 and we were delighted to be invited to the show! We were that excited decided to do a new Brew to celebrate! 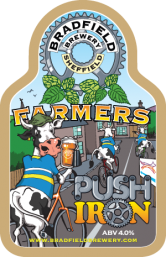 Farmers Push Iron was named after the Yorkshire term often used for a bicycle - we thought quite a fitting name! The brew went down a treat and was enjoyed by spectators and participants and a great day was had by everyone involved!